This isn’t the kind of book you read form the cover to cover. But I really enjoyed reading it chapter by chapter. What I really loved, is that the marathons are described from the inside. It could also be helpful for the runners who are about to run their first marathon. They’ll get a feeling of what it is to actually run the distance. 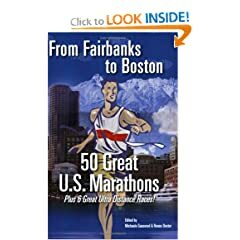 You should check the chapter on the Yakima River Marathon written by Bob where shares his special experience as a participant as well as as a runner. Aaron Scwartzbard recall his peculiar story about the Boston Marathon. He didn’t like waking up early, taking the bus to the starting line and then waiting until noon. So he decided with a group of friend to run his way to Hopkinton, running the whole marathon in reverse! This book shows the vast diversity of races available in the US. I strongly encourage you to read it.